The first choice of parents and therapists for assisting in the safe transport of individuals with physical disabilities. Designed for those who cannot sit upright unassisted. 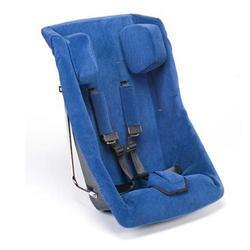 The Columbia Medical Therapedic Positioning Seat is a car seat developed specifically for children with physical disabilities that have outgrown an infant car seat and are now subject to serious injury should an accident occur. Replacement Upholstery for seat only, does not include Crotch Pad, Head Pillows or Shoulder Straps.